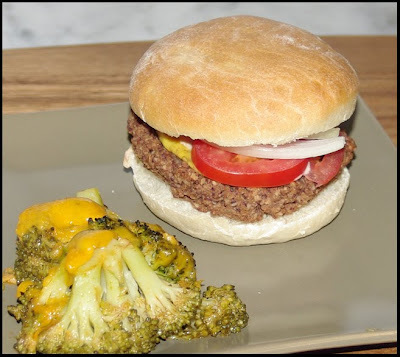 This veggie burger is made with bulgur which gives it a really nice hearty texture. I've made these several times in the last couple of weeks since they're so delicious. It's a vegan recipe which is always a big plus with me. If you're not in the mood for grilling, you can pan fry these burgers, or bake them in a 350F oven until they are warmed through and are firm to the touch. Maybe 30 minutes? Though the burgers were yummy, I'm proud as punch to say that I served them with homemade hamburger buns. Really awesome homemade hamburger buns. I don't think I'll be able to go back to store-bought buns after making these. The recipe is a Gourmet Magazine favorite and you can find it on epicurious.com, here. The buns came out so perfectly I was really quite amazed. They were tender and tasty and not dry at all. I served the burgers with some steamed broccoli topped with a little grated sharp cheddar. This was a fantastic meal and I'm just so pleased with my homemade buns! Two great components for a yummy burger! The burgers sound so good (except for the cilantro!). And wow, your bun looks perfect! You're my bread baking role model! I could eat this meal right now, Michele. I am definitely going to make those buns. Yum.